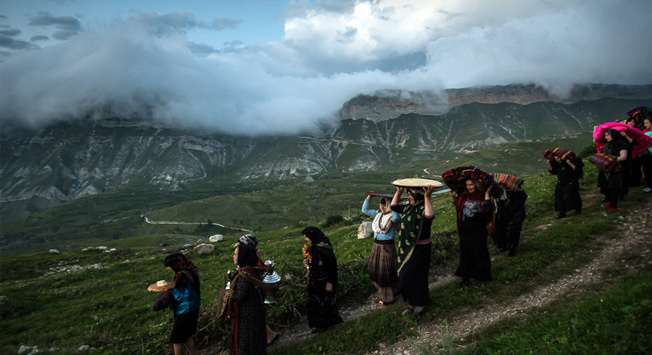 Dagestan is famous for its variety of ethnic groups who cherish their traditions, customs and culture. The diversity of Dagestan's traditions is extraordinary: you are sure to find special native customs and ceremonies in practically all the large mountain villages. Some elements of the rituals and legends stem from different historical events and originate from the time when other religions were practiced and other Gods were worshiped. This can easily be analyzed through the example of a wedding - this is indeed one of the most important events not only for the newlyweds and their families, but for the whole mountain village itself. It often happens that everybody in the mountain village attend a wedding as well as all the relatives and friends living in other mountain villages. They travel from far away to attend the wedding of their families, friends and compatriots. The Dagestani usually celebrate their weddings during the second half of summer or at the beginning of autumn. This time is chosen due to the fact that all vegetables and fruits, without which no feast can be held, have ripened. Sometimes there is more than one wedding in a mountain village bringing everyday life to a stop and the festive mood transfers to everybody. Workshops are closed and so are craftsmen's stands. Everybody in the village helps prepare for the big day! The seniors of the village must dedicate a few days to the process of distributing responsibilities among each other. Like sending out invitations, buying food, picking out musicians, deciding where to hold the wedding and choosing the order of all of these actions. Any Dagestani wedding goes on for a minimum of 3 days and there is a special procedure with which it must comply. The high-altitude Balhar mountain village is famous for its clay craftsmen. The Balhar clay pitchers, vases and toys are popular not only in the village itself, but in many towns and cities too. Besides this, the village is also famous for its wedding ceremony. People from all over Dagestan come to witness it. Such an unplanned and unexpected event can become the main highlight of any tourist's trip. The most interesting and unusual part takes place on the second day. When evening falls, a whole procession of women, bearing wedding gifts, comes to the house where the newlyweds will be living. The women bring pitchers, rugs, fabric, glassware- everything the newlyweds will need in the household. When it gets dark, men, including the groom, light up their torches and walk up to the bride's house. It is necessary to add that streets in the mountain village are not illuminated, so the only light comes from the torches. When they reach the bride's house, they meet the bride's side of the family accompanied by laughs and a good mood and they sit down together at a large table, waiting for the feast. As for the women's side of the delegation- they gather in the bride's room. After some brief dancing and socializing, one of the oldest women comes into the bride's room to supervise her and dress her up. Besides the traditional gown, the bride's head will be covered with fabric so she cannot see anything. After that she is led out of the house. The whole crowd, brandishing torches, starts moving towards the groom's house where the bride is also carefully led. During the procession bonfires are lit near each house- this is a symbol of salutation. If there is no bonfire near a house which the bride passes, it means that either her family or the groom's family is in a serious conflict with them and there will be no bonfire after all. By the time the bride, with the help of her friends, reaches the groom's house, everybody will already be waiting for her inside. Usually there are so many people that not all will fit inside the house. Before entering her room, the bride must roll a round flatbread. If the flatbread falls down with the pattern up- it's a good sign, pattern down- there are big problems lying ahead. In order to prevent the flatbread from falling with the pattern down, there are a few grannies sitting near the entrance, controlling the flatbread- if something goes wrong they gently push it to fall down correctly.